Time for another 100 Stitches post! This the Open Wave Stitch. 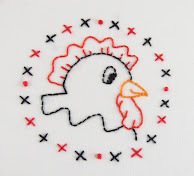 I learned this stitch from the book Embroidery Stitches by Mary Webb. This is a filling stitch but since you can see the fabric under the stitch, it give a delicate, lacy effect. I did four rows for my stitching and for each row I a different color of perle cotton floss. From lightest to darkest, the DMC color numbers are 4160, 962, 3832 and 814. This completed the first stitch on the second row. I just repeated the same steps to finish the second row. After finishing the first acorn, I decided to try using a single color for the base. I like the result much better! I outlined the acorn top with Back Stitch and filled it with Jacobean Couching Stitch and single thread French Knots. 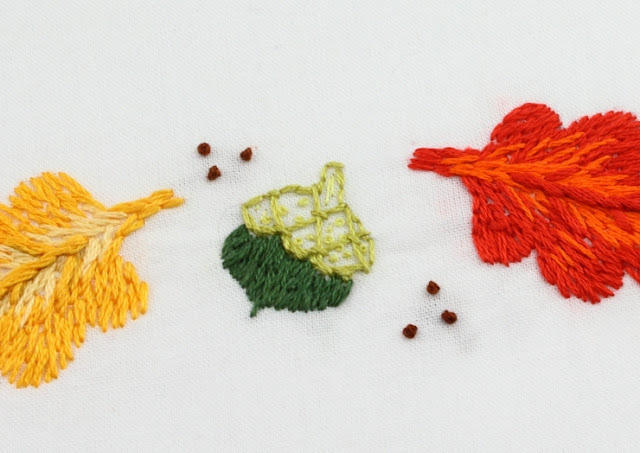 The brown accent dots are all three thread French Knots. The leaves are all done in Long and Short Stitch with Stem Stitch center and side veins. This beautiful swan is from my Ballerina embroidery pattern set. I started stitching this a few weeks ago and shared a work in progress picture on my Instagram. My next steps on this project are going to be adding embellishment stitching on the swan and whipping some of the outline stitching with metallic floss. 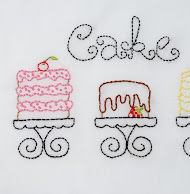 When I finish, I will post with information on the stitches used and my floss colors.